Climate controlled storage at Action 9-A's facility offers 65% maximum humidity with a cooled 85-degree high during the summer and a heated 40-degree low during the winter months. Our finished ceilings, insulated ductwork and epoxy-paint cement floors protect your belongings from moisture and condensation. We have large and small storage spaces to accommodate your specific needs for climate controlled storage in Jacksonville. Looking for business storage in Jacksonville? At Action 9-A Inc., we offer storage solutions to meet every need. Whether you're storing office furniture during a renovation or moving your company to a new location, we offer worry-free storage for your business furnishings, office equipment and company files. Our climate controlled storage buildings are fenced, gated, and equipped with keyless entry and motion sensors that turn the lights on as you approach your business storage unit. In Jacksonville, boat storage is an important part of enjoying your weekends on the Florida's beautiful waterways. We have indoor as well as outdoor spaces available for storing your boat, RV or travel trailer. Our secure facility is fenced, gated and equipped with 24-hour surveillance cameras to ensure your boat is safety stored between trips. We even have electrical outlets to provide a trickle charge for your vehicle's battery. Pack “N” Load storage has changed the way Jacksonville residents store their belongings. Gone are the days of loading a moving truck, unloading at a storage building, reloading the rental truck, driving to your new home and unloading the truck again. With Pack “N” Load containers, we deliver your storage container, pick up the container and store it, and deliver it to your door whenever you're ready. 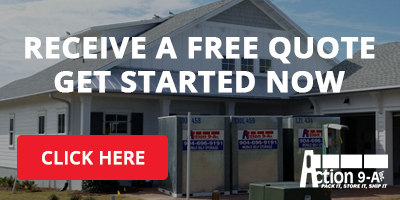 Get a Free Estimate today by filling out the form at the top-right of the page. Our self storage facility is conveniently located off Jacksonville's 9-A perimeter road and features climate controlled storage with keyless entry. For added safety and security, we have 24-hour surveillance cameras and motion sensors to turn lights on near your self-storage unit at approximately 30-minute intervals. Regardless of what you need to store, Action 9-A Inc. can help with your storage needs, call us today at 904-696-9191 to negotiate the best rates on Jacksonville self-storage and flat rate moves.